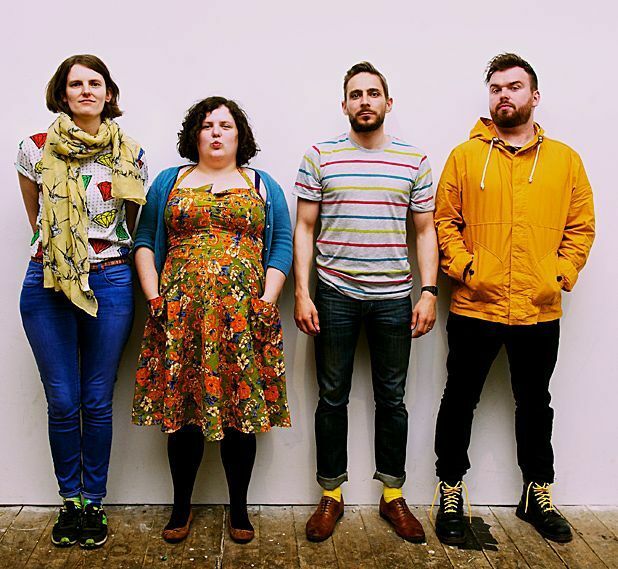 Edinburgh guitar-pop four-piece Kid Canaveral are among the contenders for the 2013 Scottish Album of the Year Award, having made it onto the longlist with their second album, Now That You Are A Dancer. The 72-hour public voting period – the winner of which will get a place on the final shortlist alongside nine bands chosen by the judges' panel – closes at midnight tonight, so vote now. Ahead of releasing the final single off the album, 'Skeletons' (accompanied by a glow-in-the-dark, floating heads video), singer/guitarist Kate Lazda and bandmates David MacGregor and Rose McConnachie talk skeleton-filled cupboards, throwing parties they can also play at, and ways to blow twenty grand. ‘Skeletons’ is the final single from Now That You Are A Dancer – have you saved the best until last? Kate:Well it’s the one single that I sing lead vocal on, so yeah, I agree. Great first question. David [who sings vocals at other times]: Whatever. What’s the story with ‘Skeletons’? It feels pretty dark. In whose cupboard are the song’s proverbial skeletons hidden? Kate: I’m not one for arguments or confrontation really. I’m a bit of a wuss to be honest. It’s the sort of thing you’d think of saying to someone in your head but never to their face. Like when you think of exactly what you want to say just after the opportune moment to say it has past. The owner of that skeleton-filled cupboard will have to remain a mystery though I’m afraid. Talk us through the new video for ‘Skeletons’ – who made it, what’s it all about? Kate: It was all from Rose’s warped imagination. Rose: I decided I wanted the video to be dark, literally, and slightly frightening, and not boring. The song is dark in mood and tone, and slightly trippy, and more electronic than anything we’ve really done before. To that end, we invested in some black lights and a lot of fluorescent paint. It’s sort of a visual representation of claustrophobic tension and madness, bubbling under the surface. And skeletons. The truly radiant genius that is Richie Morgan (who directed our last video, 'Who Would Want to be Loved', too) filmed and directed and edited it, and it is thanks to him that it looks so truly sinister. You’ve been longlisted for the SAY Award for NTYAAD – congrats on that. How did you react? Kate: It’s pretty cool. 2013 was a great year for Scottish albums. There were way more than 20 that I would have been entirely happy to see on the list so to have made it was brilliant. David: I went to the nearest toilet cubicle, locked it, and jumped up and down silently screaming 'YAAAS'. Seriously. From the longlist, who are you proudest to see yourselves sitting next to? And were there any Scottish albums of 2013 not included that you felt deserved a nod? Kate: The album’s I’ve listened to and enjoyed the most are probably Chvrches and Edwyn Collins. Both superb, and internationally recognised acts too. We might be in trouble if we don’t give our label boss Johnny Lynch (The Pictish Trail) a mention on the list of albums that missed out. He was robbed. David: I’m particularly fond of the above, and the Hector Bizerk and Frightened Rabbit albums. Hubby [aka RM Hubbert] crept up behind me the other night and whispered 'It’s my award' in my ear. The Les Revenants soundtrack [by Mogwai] is great, too. Lost Map has been in operation for almost a year now – how have you enjoyed being part of that? Do you draw strength from being part of a label/collective of independent artists – particularly in relation to, say, Kid Canaveral’s earliest years as a fully DIY endeavour, self-releasing your records? David: It’s great to work with people who share your passion and ideals when it comes to record labels. We all help each other along the way and you can’t help but benefit from the collective effort. They’re an inspiring bunch to kick about with. Kate: The rest of the label are a ludicrously talented bunch and it’s great to have a huge number of potential collaborators. Last year we recorded a version ‘Low Winter Sun’ with eagleowl and that came about from a one-off gig we did together for Record Store Day. Stuff like that really keeps things interesting. We’ve done a lot of shows with Randolph’s Leap over the last year and The Pictish Trail before that – touring with your mates is great and it certainly helps when touring on a budget if you can team up together. You throw an annual party, Christmas Baubles, which has become a bit of a seasonal sell-out, and this year you threw a 'Lumber Party' on Valentine’s Day. Will both events be returning? If so, what can we expect? What’s next recordings/releases-wise for Kid Canaveral? Has writing started for album #3 yet? If so, how’s it shaping up? Kate: We’ve started recording some demos, although it’s very early days. We’ve been having fun experimenting without the pressure of having to come up with fully formed songs. It’s something we’ve not done that much before and it’s a good, relaxed way of getting ideas down. Next on the agenda is fleshing them out. David: We recently spent some time up in Ardnamurchan recording some rough demos. We rented a cottage and all set up in the living room with the drums through the open partition doors into the dining room. The weather was beautiful, so that was both a help and a hindrance. We found out immediately before we went that we were going to be announced as one of the long-listed albums for the SAY Award, so we had a Babycham or two on the first night. NTYAAD had more electronic stuff on it than usual for Kid Canaveral (eg ‘Skeletons’). Do you believe more so in evolution than revolution? David: I think it has to be evolution. I’m all for approaching writing and recording in different ways, but there is a real chance of a misstep if you try to force things. The new material at the moment is sounding a little meatier, in the vein of ‘A Compromise’ from our last record, but we’ve been experimenting with different guitar sounds and synths. A band and their audience will soon both tire of the same record over and over again. Kate: We definitely enjoyed surprising people a bit with a few tracks on the album. I think you can expect more surprises, but don’t worry, we’re not selling our guitars just yet. Finally – supposing, hypothetically-speaking, Kid Canaveral were shortlisted for a certain award, and then went on to win said award, and that award came with a £20,000 prize. What would you spend the twenty grand on? Kate: Probably something boring like making our next album. I’m such a square. David: A plane ticket and a new identity. I suppose I’ll have to think of something else now that I’ve disclosed that. ‘Skeletons’ is out on Lost Map Records on 9 Jun; Kid Canaveral play Broadcast, Glasgow on Fri 4 Jul and Lost Map’s Howlin’ Fling, Isle of Eigg, 18–20 Jul. Public voting for the SAY award closes at midnight on Wed 28 May. The shortlist will be announced on Thu 29 May. Micro-label Lost Map host their semi-regular festival on the Hebridean Isle of Eigg. Ticket holders are ferried over from the mainland for a weekend of live music and DJs. Whimsical indie popsters who formed in St Andrews while at uni. The band is signed to Lost Map Records. A day of great music and great beer with BrewDog, the coolest craft beer label on the block, and Bogbain Farm, which was voted Scotland's Best Unusual Venue at the Scottish Event Awards. 2016's line-up included Idlewild and C Duncan.